By the time you receive this, the tundra will already be turning to its autumn golds and reds. Nome�s average first frost of the season occurs August 19th. As much as we enjoy the short summer, it�s time for us to batten things down for the inevitable and lengthy winter. One thing is constant: our gratitude for your prayers, and for your financial support. It�s gifts that we receive each month from good people like you that provide more than 95% of our operating income. 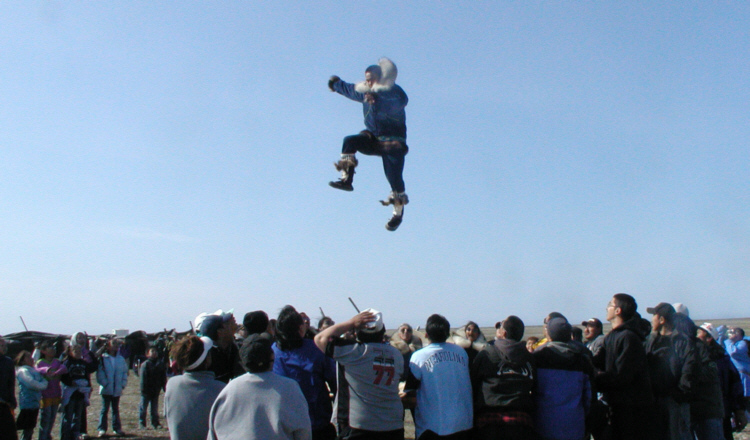 IT�S A TOSS UP (left): 280 miles north of Nome in the far-flung village of Point Hope to cover their annual whaling festival, KNOM volunteer Amy Flaherty snapped this image of a traditional blanket toss. 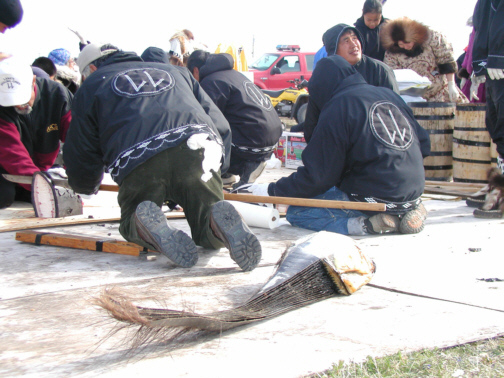 The blanket is many walrus skins sewn together, a gigantic trampoline with three dozen people serving as human springs. It�s a fun event, saved for very special occasions in the Inupiat (in-OO-pee-at, northwest Alaskan Eskimo) world. Unlike most visitors, who remain aloof, Amy rolled up her sleeves and helped prepare the village feed, accepting the job of butchering ducks with a traditional Eskimo ulu (OO-loo) curved knife. (left) Amy enjoys the festivities. (left) You can see the amount of work that goes into preparing the blanket. For this blanket, villagers used the skins of two umiaks (OO-mee-acks, wood frame seafaring boats). (left) In between tosses, participants take a rest. Note the rope handles sewn to the walrus skins. 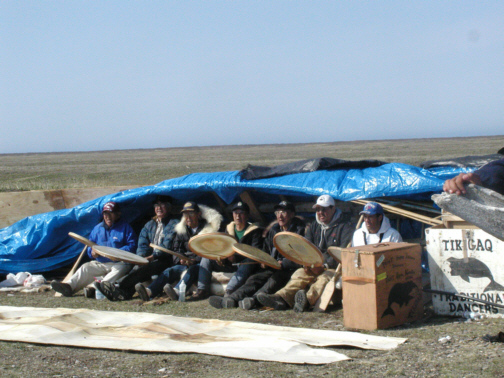 (left) Sheltered by an umiak frame from the wind, Point Hope men perform outdoor drumming to accompany the blanket toss. 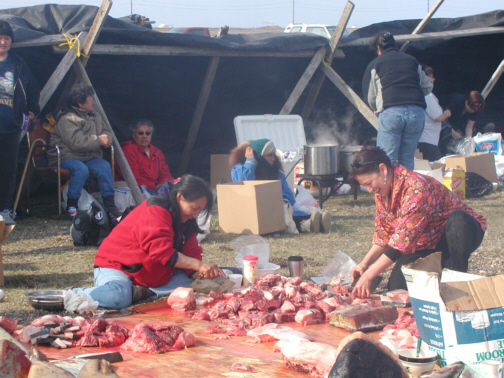 (left) Village women prepare whale meat, to be cooked and put into storage to feed their families during the winter. 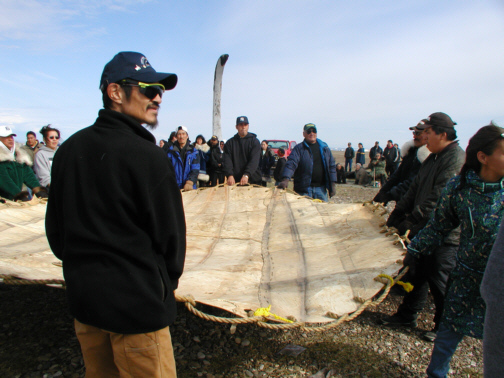 (left) Sitting on the tarp in the foreground is a portion of whale gum, which is cut up and given to elders as a treat. The dark strip attached to it is a short piece of baleen. Whales eat only tiny sea creatures, and the baleen in their mouths filters out anything larger. (left) Whale blubber is carefully sliced into portions for sharing. Each piece is measured as the width of two fingers of the whaling captain. (left) At the village feast, Point Hope residents enjoy agutuk (ah-GOO-tuk, commonly known as "Eskimo ice cream). 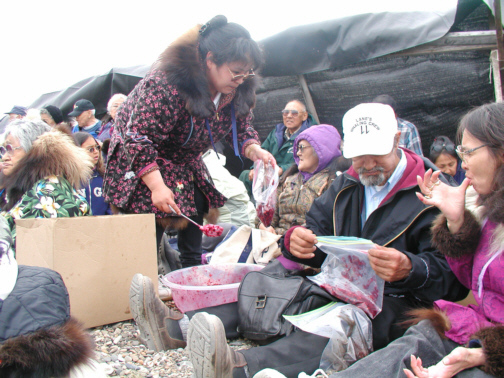 Agutuk is a mixture of tundra berries, sugar, and some kind of fat, usually caribou fat or seal oil, or shortening, or a combination of them. RECENTLY ISSUED: Alcohol abuse and its treatment were among issues discussed extensively over KNOM this summer, along with suicide prevention, firefighting and lifesaving training, and new ideas on how to provide mental health services to remote areas. Thank you for helping to make these and many other vitally important discussions possible. 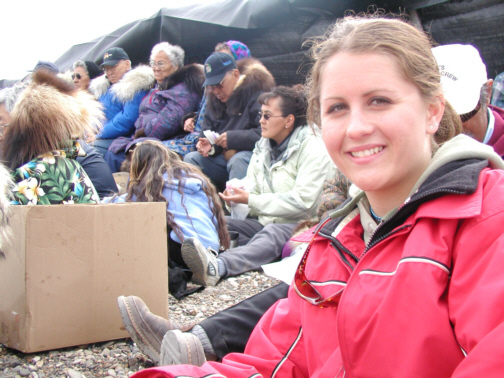 top Earlier this year, KNOM volunteer Emily Barrett flew 115 miles northwest of Nome to the village of Wales. KNOM frequently sends reporters to cover cultural festivals and events. They interview local people and also digitally record dance performances. 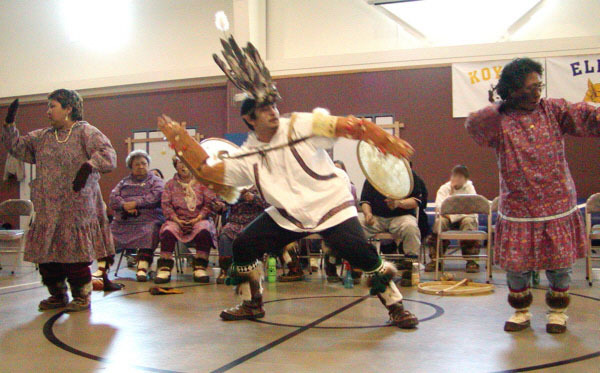 (Left) The King Island Eskimo Dancers perform the Eagle/Wolf Dance in the school gym at Wales, Alaska. To cover the Kingikmiut (approximately pronounced king-IK-myoot) Dance Festival for KNOM, I set out for a three-day trip but wound up spending five days in the village. On my final day, I found myself perched halfway up a mountain looking out over the snow-covered village. From where I sat, it felt like I was observing a completely different world than anything I had ever known. The local school was quiet now. Just a few days ago it was alive with a hundred visitors who had come to join relatives and friends for Eskimo singing and dancing. The drums started every evening and beat consistently well into each morning. Elders, adults and even the children looked proud, dressed in their kuspuks, which are traditional pullover garments, pumping their legs and swaying their arms to the hard beat of the Eskimo drum music every night. 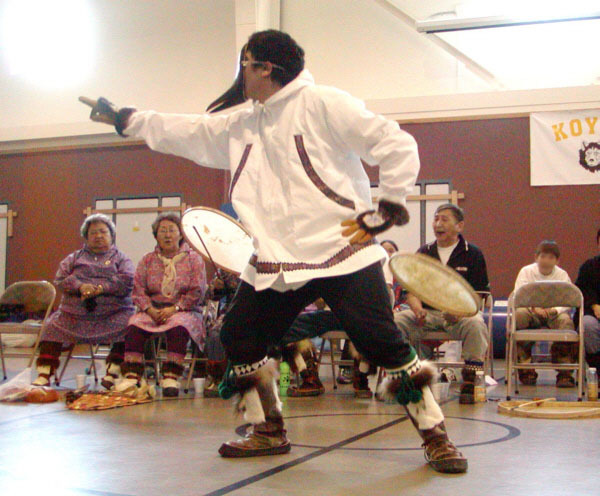 It was a reminder to me that the culture in Western Alaska is as steady as the drums to which they dance. Steady, yes, however, I was not sheltered from the signs of change while I sat above the village on the hill. A little higher and to the left of my perch was the tombstone of a teacher from the 1800�s. I wondered if he had once stood where I now sat. I was curious to know if the sight of fresh polar bear hides and musk ox heads hanging on caches swept him up with the same sense of wonder as they had for me. (Left) The King Island Eskimo Singers and Dancers, visiting Wales, perform a Raven Dance. .
On this particular trip I was constantly full of wonder and excitement. A couple of villagers had taken a few teachers and me out onto the ice of the Bering Strait the day before to meet with a visiting oceanographer giving presentations on whales. We stood on the ice, a few miles from shore. Just ahead of us was dark water, a break in the shifting ocean ice. Ice formations glided past us as we lowered microphones into the frigid water to listen for the songs of whales. We all took turns listening in awe to the low whale moans through the headphones. When we weren�t listening, we tried to make seal noises to grab the attention of a passing seal and then snap a few pictures. When I think of Wales now, I think mostly of the kind people who made me feel at home, their vibrant culture, and the stark, beautiful landscape into which Wales is nestled. It was an experience I will never forget. INSPIRATIONAL SPOT: We shall steer safely through every storm so long as our heart is right, our intention fervent, our courage steadfast, and our trust fixed on God. top KNOM is the oldest Catholic radio station in the United States, beaming into remote villages throughout vast western Alaska 24 hours a day, thanks to you. INSPIRATIONAL SPOT: People see God every day. They just don�t recognize Him. top WELCOME: (left) Meet Anna Dummer, KNOM�s brand new volunteer music director from Lansing, Michigan. With Nome's air strip in the background, this photo was taken on a dreary +45° degree July day. A 21-year-old 2003 graduate of the University of Notre Dame, Anna majored in biology. Anna first learned of the station during Notre Dame�s annual volunteer fair. �I was interested right off the bat,� she says. When she�s not working, Anna enjoys running, softball and cooking. 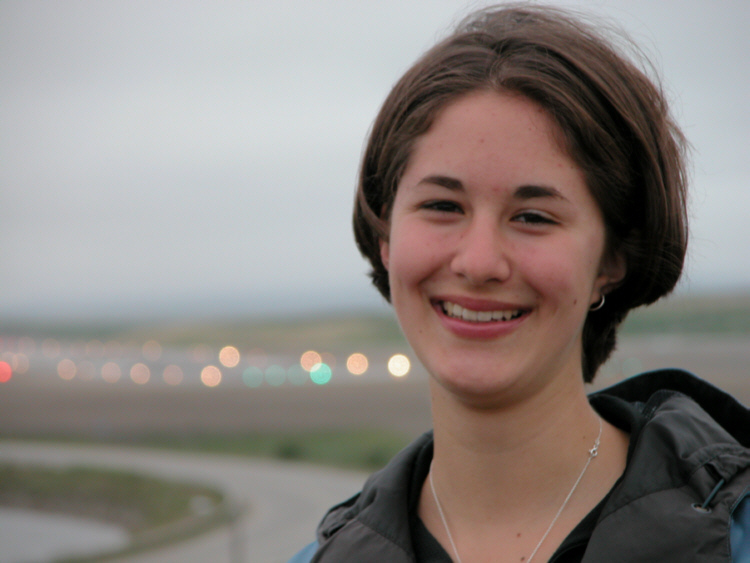 She�s especially excited to experience �the arctic ecosystem and learn about all of the animals and plants.� Welcome, Anna! 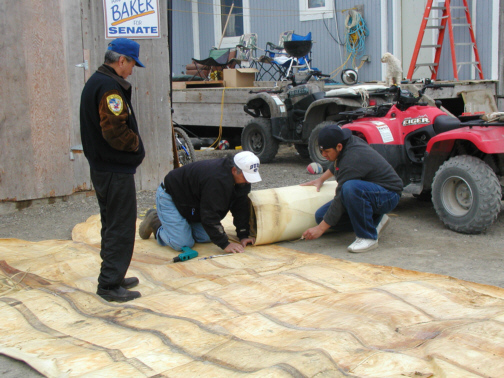 THIRTY YEARS AGO: In August 1973, a handful of students attending Nome�s boarding school arrived late, as bad weather held up their umiaks (OO-mee-acks, wood-frame boats covered with walrus skins). They finally reached the mainland, after turning back to their island village of Little Diomede Island four times. SMOKE GETS IN YOUR EYES: In June and July, smoke in the Nome skies became a KNOM news story. On a few days, visibility dropped below five miles. The origin of the smoke was massive forest fires in Mongolia and the Lake Baikal region of central Siberia. At 3,000 miles distance, that region is not exactly next door, although we are closer to it than we are to Chicago, Illinois. FLIGHTY: Volunteers Clinton White and Amy Flaherty accompanied some of the many birdwatchers who migrate to the Nome area each summer, and spoke with them over the radio. Among the birders� more unusual sightings were a Bluethroat and a Spectacled Eider. Despite attempts to lure it into sight using recorded bird song, the group failed to see one of our region�s top attractions, the Bristle-thighed Curlew, which summers here and another spot or two in Alaska, and winters in the South Pacific. There is so much more to tell you, but as always, we�re out of space. Thank you once more for your gifts and for your prayers. We formally pray for you at the beginning of each weekly staff meeting, and you are in our individual daily prayers, too. God bless you!